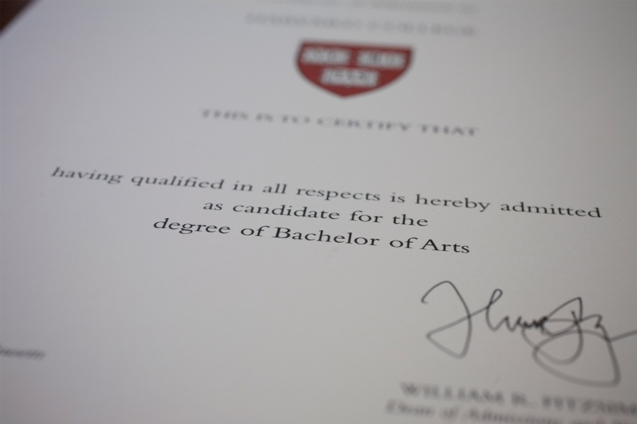 Notifications were sent on 13 December to the 935 successful applicants out of the 6,958 who applied from around the world for admission to Harvard College under the Early Action program. Those who have been offered places are not obliged to attend and have until 1st May to make a final decision. Several successful candidates were from the UK, much to the delight of all of us involved in Harvard UK Outreach, so congratulations to all of you! All applicants are asked to express a preference on their application forms for the subject area they may wish to specialize in when confirming their concentration (often called a ‘major’) mid-way through their second year. This year’s Early Action admits are striking in the increased percentage of women expressing a preference for the physical sciences and computer science. Nearly 53% of those indicating the physical sciences as their proposed academic concentration are women, compared with 33% last year. For computer science, the increase is from 29% to 43%. Read this article in the Harvard Gazette for the full story. You should now be in the final stages of gathering together the various components of your application, ready to send off before the deadline. Check your Common App. online to make sure that your nominated referees have submitted their reports. If not, chase them up urgently. In case there are technical glitches it’s always a good idea to submit your applications early – preferably before Christmas so you can enjoy the holidays in the knowledge that the applications are all safely with the relevant admissions offices. If you are a high achieving student from a state funded school, or from a family where no one has been to university before, we very much hope that you have included Harvard as one of your choices, as we particularly welcome applications from these groups. If you fulfil the criteria for the Sutton Trust US Programme, submit your application without delay. It is a fantastic opportunity that includes a one week summer school in the US and two residential weekends in the UK. For the past five years, the programme had been very successful in enabling students to gain admission to a wide range of excellent US colleges, and also to access the necessary financial aid so that they will graduate with little or no debt. Applications: Students should apply online here. Other than that, remember to keep up your practice schedule for the SAT or ACT over the next few months and aim to take the tests in the Spring of 2019. Top priority this year is to work hard so that you get excellent results in your GCSEs next summer, as these will act as a gateway to whatever comes afterwards. You should also spend time developing your extracurricular activities and pursuits (in any field), as US colleges are just as interested in your extracurricular achievements as in your academic ability. We wish all of our subscribers a very merry Christmas and a wonderful New Year. See you all in 2019!